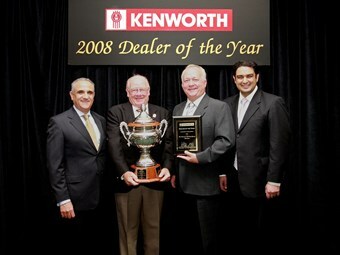 and Hurley Darra has won 2008 Kenworth Dealer of the Year award. This is the fourth Kenworth win for the dealer and a record 11 times for the Brown & Hurley Group. The announcement was made at the end of February during a special Paccar presentation attended by dealers from across Australia. The award is judged on a points system covering general dealership performance, truck sales, customer service and support. and Hurley Group, for his dealership’s consistently high performance for many years. and Hurley’s commitment to the customer in all facets – from the ongoing improvement in facilities to the way it conducts business – before, during and after the sale." and Hurley Darra enjoyed success across all of its markets throughout 2008, including major sales to large and small fleets as well as owner-drivers. A Kenworth dealer for 44 years, the Darra dealership is situated on the Ipswich Motorway, a major transport artery on the outskirts of Brisbane. The 20,000 square metre site includes an expansive showroom which displays the entire Kenworth and DAF truck ranges. It also has a large parts supermarket and workshop. This features 40 service bays, including three full-length, drive-through pits which can manage B-doubles, as well as the latest diagnostic and repair equipment. The Darra dealer has traditionally serviced south-east Queensland and as far north as Bundaberg and west to the Northern Territory border. But, in order to better manage increasing customer demand, Brown & Hurley recently launched two new full sales, service and parts dealerships. The Yatala branch opened in April last year. Located mid-way between Brisbane and the Gold Coast, it covers the southern region. The Toowoomba dealership, which opened earlier this month, services the northern and western parts of Queensland. The Brown & Hurley Group – Kenworth’s longest-serving dealer organisation – was established in 1946. Today it covers some of NSW and all of Queensland, with full dealerships operating in Darra, Coffs Harbour, Kyogle, Rockhampton, Toowoomba, Townsville and Yatala. It also has parts stores in Tamworth and Tweed Heads.